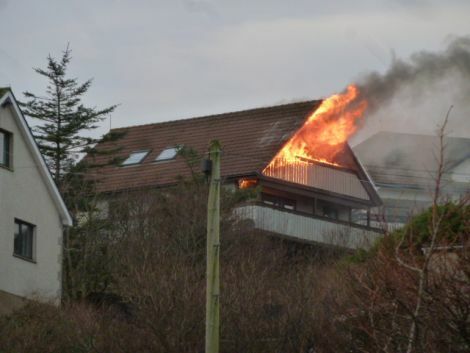 OVER £7,000 has been raised by the Shetland public for a family whose Lerwick home was badly damaged by fire a week before Christmas. The online fundraising campaign was launched by sixth year pupils at the Anderson High School as they sought to help deputy head teacher Barney Redman, his wife Matilda and their family. Six fire appliances were called to the blaze at Sandyloch Drive on Monday morning, with the service confirming that no-one had been injured. It is thought that the fire, which started on a lower floor before travelling up towards the roof, could have been caused by an electrical fault. There was no one in the property at the time. AHS pupil Charlie Haddon, who is also one of Shetland’s two members of the Scottish Youth Parliament, started the online fundraising page on Monday evening on behalf of the sixth years and by Tuesday morning it had reached over £7,000 thanks to donations from more than 300 people. He said Redman is a “hugely popular teacher in the school, as all pupils and ex AHS pupils will appreciate”. “Considering the family have just suffered an awful house fire, I think all those who can afford it should contribute a little to help out,” Haddon added. The pupil said he has been taken aback by just how much money has been raised for the teacher and his family. “It was started amongst the sixth years but it has now grown way bigger than we thought it would,” Haddon said. Redman and his family had only recently moved into the property. He said they were “totally overwhelmed by the support of the community in what has been an extremely difficult time”. The fire was on the first floor and roof area of the two-storey home, and took over two hours for several fire crew to bring it under control. It’s the second time in less than two months that members of the local community has dipped into their pockets following a house fire in Lerwick. Over £2,000 was raised to help out Helen Tait following a blaze in her Sandveien home not long after she had cancelled her insurance policy.